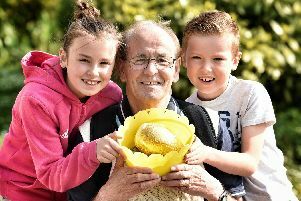 A family support charity in Chorley has reached the grand old age of 21. Over the last 21 years, Home-Start Central Lancashire has supported more than 4,100 families and trained more than 400 volunteers. In the past year alone, the organisation has supported 442 families with 894 children aged up to 11 in Lancashire through a combination of home visiting and family group support. To honour Home-Start Central Lancashire’s successes, it held two celebrations. The first was at Home-Start’s Annual General Meeting at Chorley Town Hall, where 75 guests including the Mayors and Mayoresses of Chorley, South Ribble and West Lancashire were invited to hear a presentation. Patron of Home-Start Central Lancashire Cath Hoyle said: “I am very proud to be Patron of Home-Start as it has achieved great success over 21 years. The second event was a very lively 21st birthday family party at St Joseph’s Parish Centre in Chorley, attended by 140 parents and children along with Home-Start staff and chairman Jeannie Stirling. Home-Start is now recruiting volunteers for their next six-session preparation course which will be starting on Friday November 10 at the site in Market Street, Chorley. Anyone interested in volunteering or in need of some support can ring them on 01257 241636. All Home-Start volunteers should have parenting experience and will need to have a clear Enhanced Disclosure and Barring Check and two satisfactory references before being accepted as a volunteer.